The Hughes 1B (H-1) on display in the Golden Age of Flight gallery at the National Mall building. The Hughes H-1 racer, designed by Howard Hughes and Richard Palmer and built by Glenn Odekirk, was developed to be the fastest landplane in the world. On September 13, 1935, Hughes achieved this design goal by flying the H-1 to a new world speed record of 567 kilometers (352 miles) per hour at Santa Ana, California. Highlighted in this image is the Hughes H-1 racer being displayed in the Golden Age of Flight exhibition. The Hughes H-1 racer, designed by Howard Hughes and Richard Palmer and built by Glenn Odekirk, was developed to be the fastest landplane in the world. On September 13, 1935, Hughes achieved this design goal by flying the H-1 to a new world speed record of 567 kilometers (352 miles) per hour at Santa Ana, California. Highlighted in this image are the propellers and engine of the Hughes H-1 racer. The Hughes H-1 racer, designed by Howard Hughes and Richard Palmer and built by Glenn Odekirk, was developed to be the fastest landplane in the world. On September 13, 1935, Hughes achieved this design goal by flying the H-1 to a new world speed record of 567 kilometers (352 miles) per hour at Santa Ana, California. Highlighted in this image is the engine of the Hughes H-1 racer. The Hughes H-1 racer, designed by Howard Hughes and Richard Palmer and built by Glenn Odekirk, was developed to be the fastest landplane in the world. On September 13, 1935, Hughes achieved this design goal by flying the H-1 to a new world speed record of 567 kilometers (352 miles) per hour at Santa Ana, California. Also known as the Hughes 1B, the H-1 was designed with two sets of wings: a short set with a span of 7.6 meters (25 feet) for speed record flight, and a long set with a span of 9.2 meters (31 feet, 9 inches) for transcontinental flight. The aircraft as it is exhibited here is equipped with the long set. Hughes broke the transcontinental U.S. speed record in the H-l on January 19, 1937, flying from Los Angeles to Newark, New Jersey, in 7 hours, 28 minutes, and 25 seconds. His average speed for the 4,000-kilometer (2,490-mile) flight was 535 kilometers (332 miles) per hour. The Hughes H-1 racer was developed to be the fastest landplane in the world, It was designed by Howard Hughes and Richard Palmer and built by Glenn Odekirk. On September 13, 1935, Hughes achieved the design goal by flying the H-i to a new world speed record of 352.322 mph. The record was set over a specially instrumented course near Santa Ana, California. Since Hughes did not require a sponsor for the aircraft, the H-i had no markings except the license number NR258Y (later NX 258Y) in chrome yellow against the dark blue background of the wings, and in black against the doped aluminum rudder. 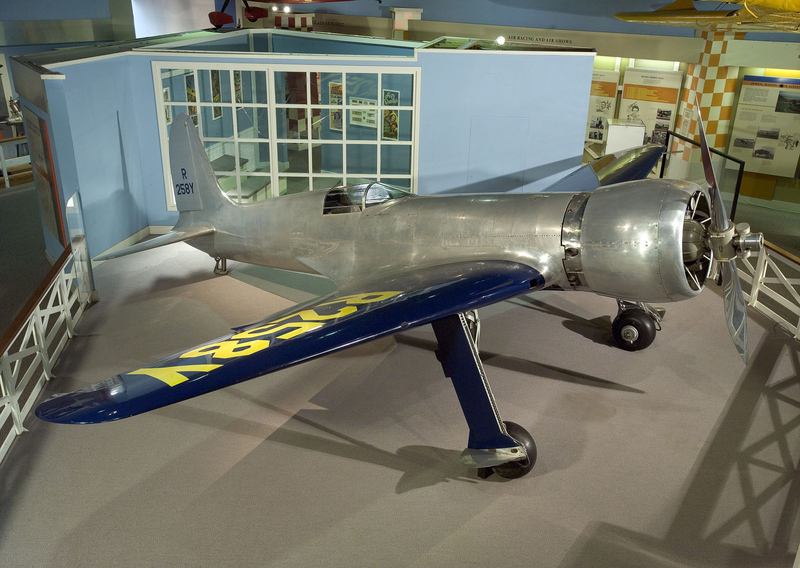 The fuselage was left in its natural polished aluminum finish. The H-i was powered by a Pratt and Whitney Twin Wasp Junior radial piston engine, which was rated at 700 horsepower at 8,500 feet but which could deliver 1,000 horsepower for high-speed flight. A wind tunnel model of the aircraft was exhaustively tested in the 200-mph wind tunnel at the California Institute of Technology’s Guggenheim Aeronautical Laboratory. Actual performance figures for the aircraft closely matched the predicted design performance. The H-1 had two sets of wings, The wings Hughes used to break the land plane speed record were of a low aspect ratio and shorter than those with which it is now fitted. The wings now fitted on the aircraft span 31 feet, 9 inches. have a moderate-aspect ratio, and were used when Howard Hughes broke the transcontinental speed record in the H-i on January 19, 1937. Hughes departed Los Angeles before dawn and arrived at Newark Airport, outside New York City, 7 hours, 28 minutes, and 25 seconds later. His average speed over the 2,490-mile course was 332 mph, and this nonstop flight was truly an outstanding accomplishment. The Hughes H-1 was designed for record-setting purposes, but it also had an impact on the design of high-performance aircraft for years to come. Some of the outstanding design features of the H-1 were: a close fitting bell-shaped engine cowling to reduce airframe drag and improve engine cooling; gently curving wing fillets between the wing and the fuselage to help stabilize the airflow, reduce drag, and prevent potentially dangerous eddying and tail buffeting; retractable landing gear to reduce drag and increase speed and range (typical of everything or the H-1, the landing gear was so perfectly fitted that the gear fairings and doors are difficult to see without looking closely); all rivets and joints flush with the aircraft’s skin and flathead and counter-sunk screws on the plywood wings; ailerons designed to droop 15 degrees when this flaps are fully extended to improve lift along the fu length of the wing during landing and takeoff; the pilot sitting in a smoothly faired and totally enclosed cockpit, which had an adjustable canopy windscreen to permit easy entry and exit from the aircraft. The Hughes H-1 racer was a major milestone aircraft on the road to such radial engine-powered World War II fighters as the American Grumman F6F Hellcat and Republic P-47 Thunderbolt, the Japanese Mitsubishi Type 0 (Zero), and the German Focke-WuIf FW 190. It demonstrated that properly designed radial-engine aircraft could compete with the lower-drag inline designs despite having larger frontal areas because of their radial engine installations. The H-1 was kept in the Hughes factory at Culver City, California, until it was donated to the Smithsonian Institution in 1975. It is now exhibited in the Golden Age of Flight gallery of the National Air and Space Museum. Famous film producer and entrepreneur, Howard Hughes, set his sights on building the world's fastest land plane. The result was the sleek Hughes H-1 Racer, which broke the world speed record in 1935, and later the US transcontinental speed record in 1937. Gift of the Summa Corp. Experimental, single engine, monoplane for air racing; wood wings with blue paint; yellow markings; bare aluminum fuselage.